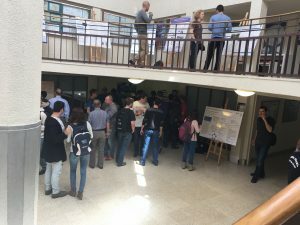 The Annual Graduate Studies Research Day took place on April 13, 2016 at the Faculty of Aerospace Engineering in the main entrance area of the Faculty building. 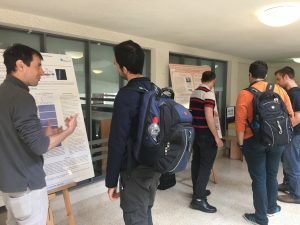 The Faculty graduate students’ research was exhibited in poster format to undergraduate and graduate students, Faculty members, candidates for graduate studies and industry representatives. 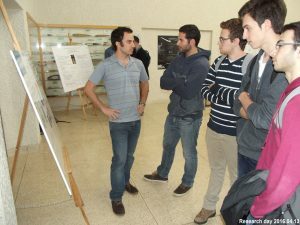 The first prize (1000 NIS) in the Master’s category was awarded to Anton Ronis, under the supervision of Assistant Professor Yigal Kronhaus. The second prize (500 NIS) in the Master’s category was awarded to Arseny Livshitz, under the supervision of Associate Professor Moshe Idan. The first prize (1000 NIS) in the Doctoral category was awarded to Gershon Kats, under the supervision of Professor Barry Greenberg. The second prize (500 NIS) in the Doctoral category was awarded to Michael Weidenfeld, under the supervision of Assistant Professor Avshalom Manela. 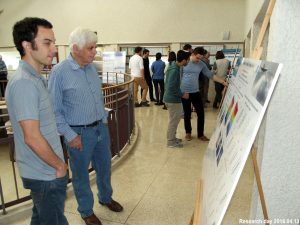 Last but not least, the winner of the “people’s choice” poster, based on ballot voting by attendees at the Research Day, was Yafim Yavlochkin, under the supervision of Assistant Professor Beni Cukurel.